These awards were established in 2006 in honor of a pioneer hosta hybridizer and founding member of The American Hosta Society, Eunice V. Fisher of Oshkosh, Wisconsin. There are two parts to this award. 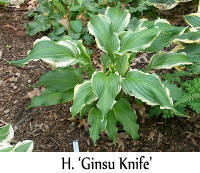 First, the Hybridizer Merit Award is given to a person who has contributed to the advancement of the genus, Hosta, through his or her hybridizing efforts. The second part, the Distinguished Merit Hosta Award, goes to a cultivar of the hybridizer's choice from his or her breeding program.